Pictured: Cleveland's own, Harvey Pekar. Editor's note: While I had seen the book "American Splendor" on the shelves at comic shops much of my life, I never picked up a copy. For me growing up, if it wasn't a superhero title, I didn't care for it. But, after seeing the film American Splendor several years ago, I finally got to understand and enjoy the brilliance of Harvey Pekar. Also, as I get older, I have a much greater apprecation for the boundlessness of comics as a medium. With his writing, Harvey shows that the complexities of daily life are often as interesting as the elaborate, fictional worlds created in comics like Spider-Man, the Fantastic Four, or Superman. 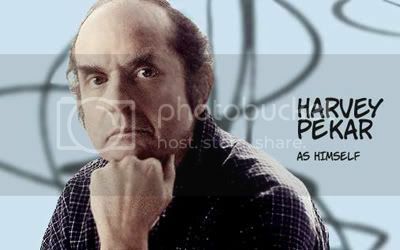 So, this post is intended to introduce Harvey Pekar to those who haven't already become acquainted with his work. I hope you enjoy. 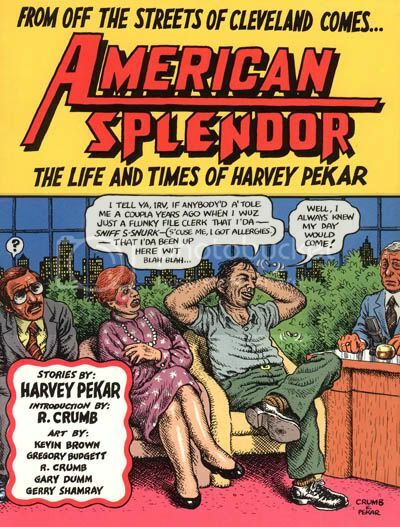 Cleveland, Ohio native Harvey Pekar is best known for his autobiographical slice-of-life comic book series "American Splendor", a first-person account of Pekar’s downtrodden life. The series has been published on an approximately annual basis since 1976. Pekar self-published the series until the early 1990s, when Dark Horse took over publication. In 1987, Pekar was honored with the American Book Award for the series. Dark Horse celebrated the 25th anniversary of "American Splendor" in 2001 with a special issue. "American Splendor" is illustrated by high-profile artists such as Robert Crumb, Frank Stack and Joe Sacco. The comic strip's international appeal was also made evident through Pekar's collaboration with comic book illustrator Colin Warneford of Gateshead, England for the aptly-titled issue "American Splendour: Transatlantic Comics." Pekar began his writing career as a prolific music and book critic. His reviews have been published in The Boston Herald, The Austin Chronicle, Jazz Times, Urban Dialect (a paper native to Cleveland), and Down Beat Magazine, among many other journals. His critiques are available on the Internet at numerous websites and dispersed amongst personal homepages from his devoted fans. 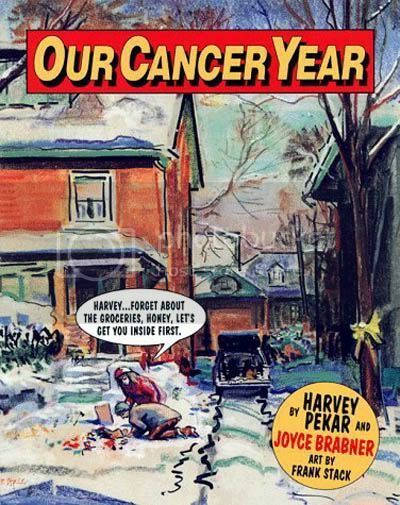 Pekar also collaborated with his wife, Joyce Brabner, on a book-length autobio comic "Our Cancer Year" (Four Walls Eight Windows). Pekar began working on a freelance basis with the critically acclaimed, award-winning radio station WKSU on April 12, 1999. Since his debut at the station, he has been honored with two prestigious awards. In July 2000, he was awarded first place in the PRNDI (Public Radio News Director’s Incorporated) "Commentary/Essay" section for his piece, "What's In a Name." In March 2001, RTNDA (Radio-Television News Director’s Association) honored Pekar with a 2001 Regional Edward R. Murrow Award for Best Writing for his piece "Father’s Day." The piece was entered into the national awards competition of the same name. Pekar has made two cameo appearances in films and appeared on "Late Night with David Letterman" eight times between 1986-1988. It was Pekar's interest in politics, and specifically NBC's affiliation with General Electric, that got him banned from the show. Eventually he was asked to return and Pekar made two more appearances in the early 1990s. Despite keeping himself extremely busy with all of his contributions to various kinds of media, Pekar maintains a very low profile in Cleveland. In 2001, he retired from his job as a full-time file clerk at the local VA Hospital, where he had worked since 1966. He lives with his wife Joyce and they are the proud guardians of 15-year-old girl, Danielle. There are many custom [url=http://burberry-sale.manifo.com]burberry sale[/url] that are available in the market. One of these [url=http://www.burberrycanada.info/]burberry scarf[/url] is really a handbag. creative designers are sold from expensive prices. [url=http://www.burberrycanada.info/burberry-women-tote-bag-c-14.html]burberry outlet[/url] women opting for replica [url=http://longchampsoldes.over-blog.com]longchamps pas cher[/url]. This particular goes especially for the females that do not need to spend the majority of their hard-earned cash on the luxurious. choose a geniune [url=http://sacsguess.over-blog.com]sac guess pas cher[/url] instead. It is possible to find real [url=http://sacsmichaelkors.over-blog.com]sacs michael kors[/url], whenever you understand where to find. [url=http://isabelmarantsneakersfr.over-blog.com]isabel marant collection[/url]. You may be glad to know purchase a designer handbag. Fundamental are available, very easy head out once we state. [url=http://burberry-scarf-outlet.weebly.com]burberry outlet[/url] Electric outlet They are able to function numerous scintillating artwork. Talk to almost any store [url=http://burberry-bags-outlet.weebly.com]burberry bags[/url] as well as business about their obtain rules. [url=http://burberry-bags-sale.weebly.com]cheap burberry[/url]. They are usually inexpensive [url=http://sacslancelfr.weebly.com]lancel[/url] as well as equip purses. All of the increasing designs work best courses [url=http://burberrycananda.weebly.com]burberry sale[/url] towards specific. UjcPun Master [url=http://chaussuresisabellemarant.tripod.com/]isabel marant[/url] NhaIvh A [url=http://isabellemarrant.devhub.com/]isabelle marant[/url] RglTqg Hot debate [url=http://sacslongchampsoldes.devhub.com/]sac longchamps en solde[/url] TcrCxw [url=http://prixsaclongchamp.devhub.com/]sac pliage longchamp[/url] IstOhg Around Controversial Systems [url=http://sacguessensolde.devhub.com/]sac guess en solde[/url] along with wood buildings. Hot review [url=http://www.sacguesssoldes.info]guess femme[/url] unearths the critical info [url=http://www.sacguesssoldes.com]sac guess[/url] regarding france and in addition the reasons you will need to take [url=http://www.lunettesdesoleil2013.biz]lunette oakley[/url] action right away.